Trenchless sewer repair has been available to property owners in St. Peters, Missouri for the last fifteen years, yet a great deal of you is unfamiliar with it. 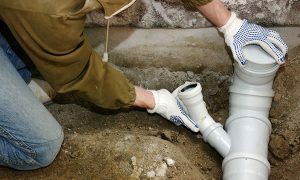 This is due to the fact that the majority of plumbing companies still rely on the outdated traditional excavation method, and the reason may surprise you. Digging a large and damaging trench in order to reach the sewer pipeline for repair or replacement certainly does not benefit the residential, commercial, or industrial real estate owner. The traditional excavation method does not benefit the customer by saving any time. The process is actually significantly longer than the trenchless sewer repair approach. Last but certainly not least the traditional excavation method does not benefit the property owner by saving you any money. The old school method actually costs just about double the price of the technologically advanced trenchless sewer repair solution. So why do most plumbing companies still employ the use of this outdated, destructive, time consuming, and overly expensive sewer repair method? The answer is two-fold. The plumbing industry as an entirety is extremely slow to adopt the technology. In reality, most plumbers are afraid of it. The same processes, equipment, and tools have been utilized for so long that it becomes too comfortable to give up. Then there are the plumbing companies that see the light at the end of the tunnel and would like to adopt the newest technology, but lack the money to invest in the training and equipment. Fortunately, there is a small percentage of plumbing contractors, like Nu Flow Technology out there. We see the light at the end of the tunnel. We also have the financial resources to invest in and develop the most cutting-edge training, equipment, tools, and materials in order to save our customers money, time, and the destruction of their landscaping and hardscaping. Take the Nu Drain trenchless pipe lining procedure for example. Nu Flow Technologies invented the procedure in order to provide property owners with a non-invasive, non-destructive, fast, and affordable trenchless sewer repair option. It does not require exposing the sewer pipes in order to repair them. Only a small access point is needed at one end of the sewer pipeline. A high-tech machine also developed by Nu Flow Technologies inserts a tube through the access point into the sewer pipeline. The tube is covered with a felt liner that has been saturated in a wet epoxy resin. The tube also contains an inflatable air bladder. Once in place, the tube is inflated allowing the wet epoxy resin to coat the interior surface areas of the sewer pipes. The tube is deflated and removed so that the epoxy resin can cure in place. Once it does a hard pipe liner or pipe within a pipe is formed. The new pipe liner instantly repairs any cracks, chips, breaks, holes, and other problems within the existing sewer pipeline. It also prevents future issues from happening and will last for well over fifty years. The entire Nu Drain trenchless pipe lining process takes one day to complete and is approximately fifty-percent more cost-effective than the traditional excavation method. If you are interested in scheduling a free trenchless sewer repair estimate than please contact Nu Flow Technologies today. We are here to help you get through all of this.